Windows 8 was released in October 2009, .0005 milliseconds after Windows 7 was released and bombed. It took 24 years to develop, and so far has lost Microsoft $90,000,000,000. In 1985, two operating systems were being planned out by the Blinky Smoked Meats and Fishes company, which would later become Micro$oft. One was a primitive DOS-based 8-bit system codenamed "Lansing", and an NT-based 128-bit OS codenamed "Whore". In alpha tests, Whore would freeze and crash because its graphics system was incompatible with the primitive computers of yesteryear, so they ditched Whore, and continued on with Lansing, which would be released as "Windows 1.0". 22 years later, when new, more graphically enhanced technology was being developed, they started working on Whore again. 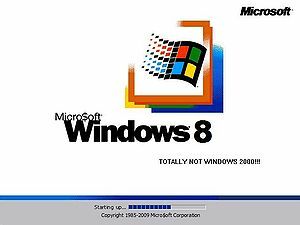 Unfortunately, it couldn't be completed by the deadline, so Micro$oft was forced to copy Windows 2000's source code and repackage it as Windows 8. Because everyone has a touch screen, apparently. Windows 8 features Metro, the most recent advance from Microsoft on user interfaces, which was entirely developed in Microsoft Paint technology. For those without comedic tastes, the so-called experts at Wikipedia have an article about Windows 8. This version of Windows really knows how to push your guilt buttons. Windows 8 got universally negative receptions that had absolutely no positive reception, by the morons who overflow the pros that they asked to test this OS's non-existant awesomeness. They expected something good, but got something unoriginal. (A man can dream, can't he?) PC World gave it a 0.5, the only rating they can give anything that is crap, like Windows and we hate anything Windows. 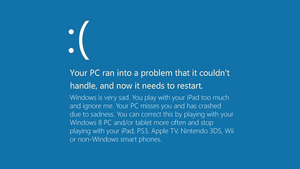 The disaster that this OS caused macs so much pain with lots of non-existant awesomeness of Windows 8 caused Microsoft to gain nothing, and lose $90,000,000,000, and Bill Gates was so happy he was not going to heaven, but still got kicked out of his posh mansion. You can see him on the corner of 98th and Woodinville in Redmond, working as a guy who helps people. A.K.A. a prostitute. Typing "Should've got a Mac" into the Run bar will cause a grue to pop out of your monitor and eat you.